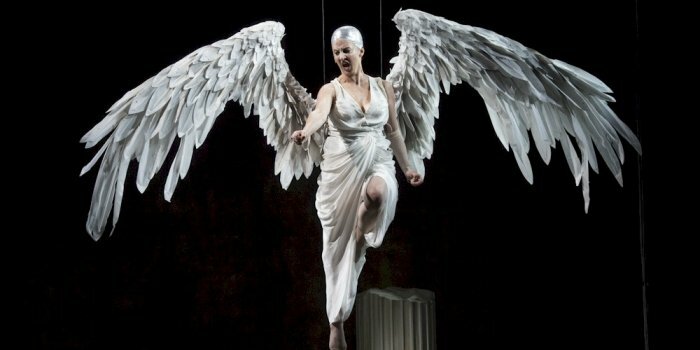 There is no denying Angels in America Part Two: Perestroika is a marathon. Like the “runner’s high” though, it is also an incredibly exhilarating experience. At four hours, including two intermissions, Tony Kushner’s epic exploration asks a lot of its audience (and its actors). Thanks to the stellar cast and creative team of this Arts Club Theatre Company production, audiences could not be in better hands. 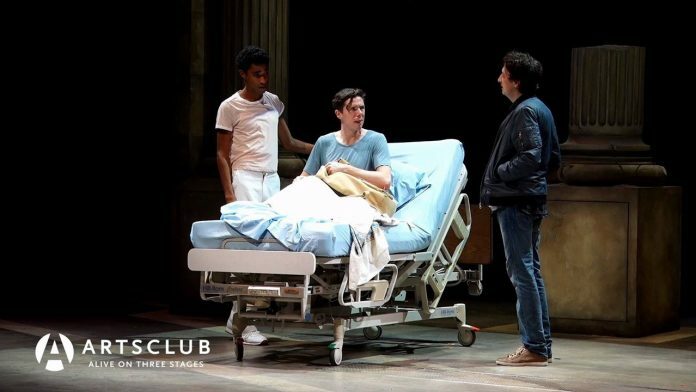 Beginning where we left off at the conclusion of Angels in America Part Two: Millennium Approaches last spring, Perestroika continues Kushner’s dense examination of politics, religion, sexuality, and love against a backdrop of the 1980’s AIDS crisis. 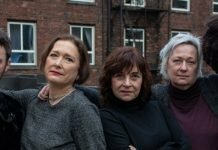 For those who saw Millennium Approaches last season, the first thing you will notice is both the cast and the creative team have returned for Perestroika. While this continuity is not always a necessity, nor always possible when the two halves are separated by months, it is immediately apparent just how much those on stage, and behind, have grown with this massive show. There is a clarity in this production, making Kushner’s larger-than-life and complex story so spellbinding. Layered, nuanced and asking some very big questions, this 20th century masterpiece could easily collapse under its own weight. Thanks to Kim Collier’s vision though, Kushner’s intricate web never loses focus, in a place where the divine and the earthly collide in a glorious harmony. It runs the entire spectrum of emotions, a celestial roller coaster where one moment we are asked to condemn, and in the next forgive. It is a reminder of the inter-connectivity of life, its isolation and desires. And even as Kushner’s story may be specific to time and place, there is a transcendent quality to the proceedings; while we may have seen some “restructuring” in the past three decades, Perestroika is a grim reminder of just how much more we have to achieve. With its timeless themes, still sadly resonating, Perestroika may take place in 1986, but as with Millennium Approaches, it also feels very 2017. And while there is a potential for disillusionment on just how little humankind has progressed, there remains a hope we will one day arrive at that beautiful intersection of “forgiveness, where love and justice finally meet”. Returning as Prior Walter come Prophet, Damien Atkins once again gives a superb performance, for which he took top acting honours at last year’s Jessies. The vulnerability in Millennium Approaches gives way to a steadfast resolve. Ravished by AIDS, he hobbles across the stage seeking to make sense of what he is called upon to do. Atkins is supported by an equally nuanced cast. Stephen Jackman-Torkoff finds an honest balance of the funny and serious as Belize, and Ryan Biel continues to explore the desire and loneliness of Louis with terrific results. 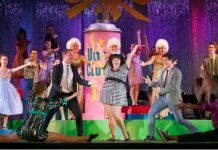 Celine Stubel’s continuing journey as Harper is empowering and ultimately joyous, and Brian Markinson gives further depth to his role as Roy M Cohn, giving small glimpses to a humanity often masked by fear. Of the major returning characters from Millennium Approaches though, it is Craig Erickson as the sexually conflicted Joseph Pitt who sees the most growth. Each time Erickson enters there is a sense of longing pouring from his heart and across the stage. Erickson’s portrayal makes him one of Kushner’s most sympathetic characters; not an easy feat for one who is badly stained by his own duplicity. Receiving more stage time in Perestroika are Lois Anderson and Gabrielle Rose, who were briefly introduced in Part One. As with all members of this cast, save Atkins, they each play multiple characters. It is in their central roles of The Angel and Hannah Porter Pitt respectively though where both shine. As the heaven-sent messenger, Anderson performs much of the time on wires suspended above the stage floor. A towering and bold presence, it is an imposing image made that much more impressive by her powerful performance. Rose comes into her own as mother to Joseph. There is a simultaneous bewilderment and sense of awe which permeates through her performance, with compassion and a desire for understanding as the ultimate destination. Stephen Jackman-Torkoff, Craig Erickson, and Brian Markinson in Angels in America, Part Two: Perestroika. Photo by David Cooper. Bringing all its disparate pieces together is director Collier. Where some of the intimacy was lost in the use of video in Millennium Approaches, here Collier abandons that artifice. Ensuring Kushner’s lengthy play is not extended beyond a single moment necessary, every transition on stage is a well-oiled machine. Many of the images Collier creates with the help of her creative team, including John Webber’s lighting and Ken MacKenzie’s set design, are simply breathtaking. She is helped immensely once again from Torquil Campbell and Alessandro Juliani’s original music and sound design. With its long run time and complex themes, this may be a tough sell for some audiences. 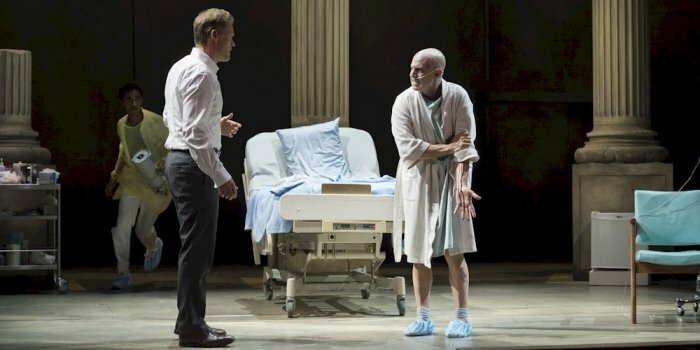 But with its clarity of vision and story, coupled with an outstanding ensemble and creative team, Angels in America Part Two: Perestroika may very well be the best thing you will see on stage this year. A final word for those who may have not seen Millennium Approaches last season. While seeing Part One will definitely help in your appreciation for Part Two, it is not a necessity. A synopsis is provided as both reminder and access point. The Arts Club has also provided a video synopsis (below) which can be viewed prior to attending. Angels in America Part Two: Perestroika by Tony Kushner. Directed by Kim Collier. An Arts Club Theatre Company production on stage at the Stanley Industrial Alliance Stage (2750 Granville St, Vancouver) until October 8. Visit http://artsclub.com for tickets and information.